The following is the full article details: Half off Select liquor, beer and wine from 11am-6pm!! Dawn your ugliest sweater and come enjoy a great day at CBB. 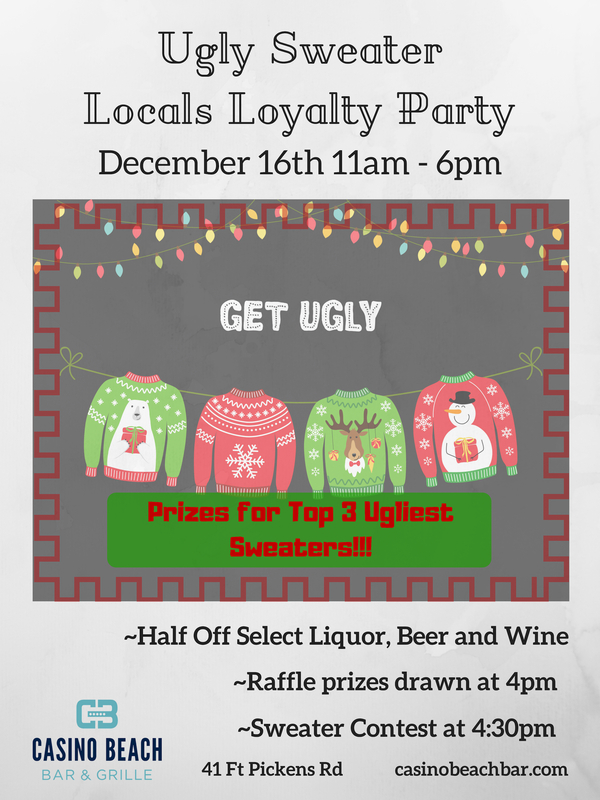 We will have raffle prizes drawn at 4pm and award the winners of the ugliest sweater contest at 4:30. All raffle money will be donated to the Baptist Health Care Foundation to support Lakeview Center and Families First Network's Operation Santa program, which provides gifts to nearly 2,000 foster children in our community this holiday season. **A COPY OF THE OFFICIAL REGISTRATION AND FINANCIAL INFORMATION MAY BE OBTAINED FROM THE DIVISION OF CONSUMER SERVICES BY CALLING TOLL-FREE WITHIN THE STATE, 1.800.435.7352. REGISTRATION DOES NOT IMPLY ENDORSEMENT, APPROVAL, OR RECOMMENDATION BY THE STATE.